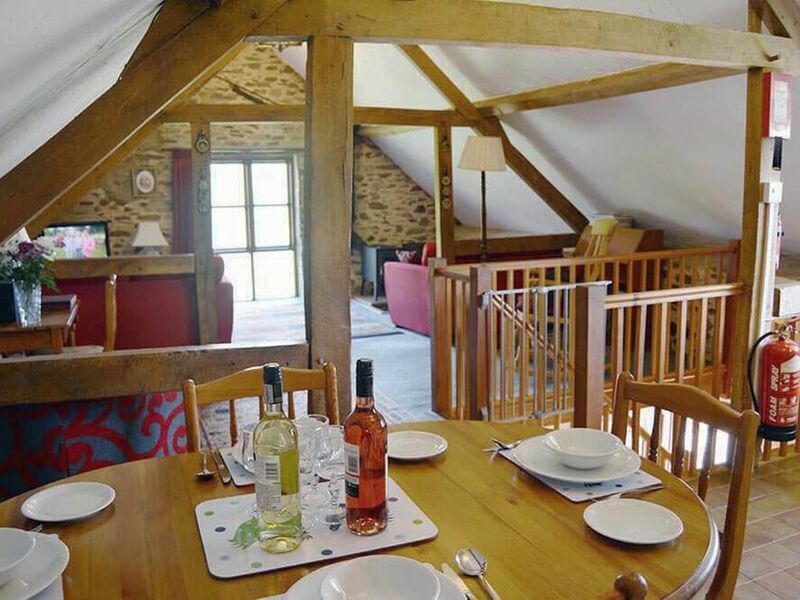 Welcome to Norton Cottage, our delightful 'upside down' stone barn conversion with plenty of room for four plus pooch! Located in the glorious surroundings of Exmoor National Park on the Devon/Somerset border, it's just five miles from Dulverton and within easy reach of the coastal towns of Porlock, Lynton and Lynmouth. Norton Cottage has upside down living accommodation, with an open plan living space on the first floor to take in the superb views over the open countryside. This spacious area has an airy feel with scissor beamed ceilings, and comprises a sitting area with valley and woodland views and a dining kitchen with views across the front lawned area and moorland beyond. With the added benefit of a warming wood burning stove in the sitting area, perfect for cooler evenings, this cottage provides a very comfortable holiday home. Ground floor: En suite bathroom with bath and separate shower to double bedroom. En suite bathroom to twin/double bedroom zip and link beds. * This cottage welcomes dogs and other pets, providing they are well behaved. Pets are charged at £3.00 per day per pet, or £20 per week per pet. Reception for mobiles, although currently limited, is showing signs of improvement. However there is a pay phone and fax in the main house. Barbecues and related tools are available on request. The first £10 of electricity is free and the owners charge you their current supplier’s price for any additional electricity used during your stay. Additional beds in the cottages are priced at £30.00 per week. Horses and ponies on a DIY basis, with stable, use of tack room and grazing at £40.00 per week or £7.00 per night. Minimum stay 2 nights in off peak periods. Minimum stay 7 nights Saturday to Saturday during Summer High season. Check-in is after 4PM Enjoy your stay, thank you! Great location to explore surrounding area. Ample accommodation for 4 of us plus the dog....the open plan rooms upstairs and large hall area made it easy living.....particularly in wet and muddy weather! Kitchen pretty well stocked....we would have benefited from one larger casserole or pan. Use of oven would have been easier with written instructions? Just a suggestion....particularly in the colder months, a big reminder to bring £1 and £2 coins for electricity top up would be helpful.....also, would there be any mileage in putting in some night store radiators, to take the edge off the cold and keep any potential damp at bay? We have put them in a flat and keep them ticking over all year...they work a treat. Charles was very friendly and helpful....and the scones on arrival were a welcome touch! This traditional stone barn conversion is located in the glorious surroundings of Exmoor National Park on the Devon/Somerset border, just five miles from Dulverton and within easy reach of the coastal towns of Porlock, Lynton and Lynmouth. The cottage is a perfect base for exploring Exmoor, with easy access to its superb footpaths, bridleways and dramatic scenery. Or simply relax amongst magnificent views and wildlife and enjoy the absolute peace and quiet! A wide variety of moorland birds and mammals such as hares and rabbits, stoats and weasels, to say nothing of red deer, are regular visitors. Additionally Exmoor ponies are often to be seen grazing on adjoining common land. The other three holiday cottages at West Hollowcombe Farm, are Smiddy Cottage (sleeps 4), Jasper Cottage (sleeps 4) and Kiri Cottage (sleeps 6). All four cottages can be booked together for larger groups to accommodate up to 18. Please telephone 01275 21 75 75 for more details. The majestic lake at Wimblewall Country Park (11 miles) is also a premier trout fishing location, and provides tuition in numerous water sports, including sailing, windsurfing and canoeing.